As today, the 1st of July is a special day for our cousins over in Canada, and they celebrate with Canada Day, we thought we’d bring the Canadian iOS faithful a few Canada Day iOS apps for the iPhone, iPod Touch and Apple iPad. First for those that may not know what Canada day is, according to Wikipedia, Canada Day is a federal statutory holiday for celebrating the 1st of July 1867, enactment of the “British North American Act,” that united 3 British colonies to form what we know today as Canada, so Canada Day is actually Canada’s birthday. 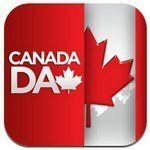 Canada Day in the Capital, and iOS app for the iPhone, iPod Touch and Apple iPad that offers an official guide to what Canada Day festivities are going on in Ottawa and Gatineau, and gives a concise listing by site of all the festivities going on, on July 1st. The Canada Day in the Capital app now features integrated Facebook and Tiwtter so the user can share what they are up to on Canada Day, and features an embedded map, and have now received some minor bug fixes. 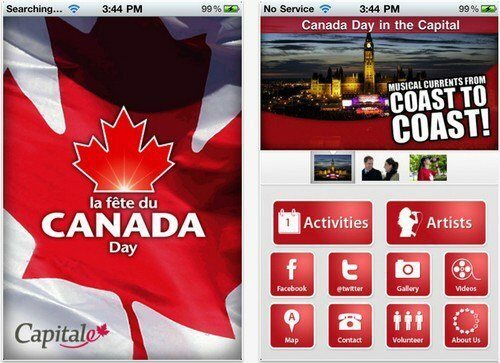 Canada Day in the Capital for iOS devices is available to download to your chosen device as a free app from iTunes. Next up we have an app called Official Canada Day, an app that will apparently enable the user to experience Canada Day like never before, and enable the user to participate in an innovative crowd-sourced conversation so you can share what defines Canada Day to you. The Official Canada Day app allows the user to create their own Canada Day post cards for sharing, and features customisable stamps, photos and themes, and the ability to send a quick “Here I am” massage to your friends so they can locate you. The Official Canada Day app is again a free download available from iTunes. Then we have a simple fun iOS game to pass your time away called Canada Day: Canada Jump, a simple app for the iPhone, iPos Touch and Apple iPad whereby the user gets to play Sir John A. McAwesome. As the Canada Day: Canada Jump title suggest, as Sir John A. McAwesome your mission is to jump right to the top via floating platforms. 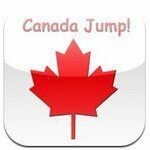 The Canada day: Canada Jump app is available to purchase from iTunes at a cost of just $0.99. Then we have the Canada Day iPhone Version app that celebrates Canada’s birthday by delivering such things to the user as the history of Canada Day, and covers such things as politics and government, law, provinces and territories, economy, science and technology, national anthem, culture, and more. There is also a version of this app for the Apple iPad called Canada Day iPad Version, with both apps available from iTunes with the iPhone version costing $0.99, while the Apple iPad version will set you back $1.99.